Good news to households! 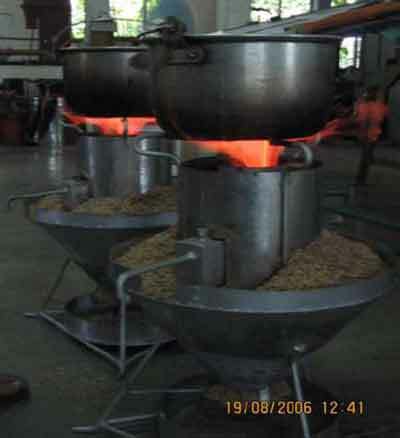 Cooking using the traditional rice husk stove can now be done with improved operation by steam injection. The rice husk quasi gasifier stove is a semi gasifier cooking device that adopts the steam injection technology on cookstove of Mr. Hao Zhengyl of Kunming City, China with the existing conical grate rice husk stove. 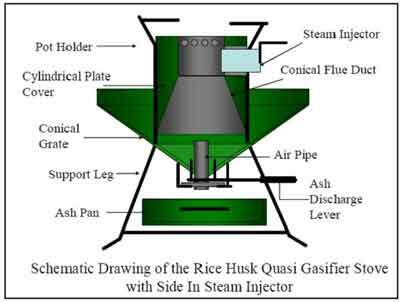 With rice husk quasi gasifier stove, an improved flame for cooking can be obtained from burning rice husk. 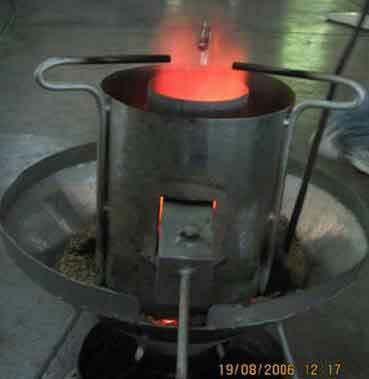 The stove, as schematically shown, consists of a conical grate in inverted position having a grate area of 0.04 m2, a cylindrical plate cover having a dimension of 0.2 m diameter by 28 cm high, a conical and cylindrical flue duct that receives burning gases and directs it to the pot, a secondary air pipe that is centrally located in the grate, an ash discharge lever to remove burnt rice husk during operation, a pan to collect ashes that is falling from the grate, a support stand, and a pot holder. Steam is injected at the side of the cylindrical cover through the cylindrical flue duct that is located above the conical duct. By injecting steam, a more improved flame is generated during the burning of gases.